Yorebridge House is situated by the river on the edge of the unspoilt village of Bainbridge, Wensleydale in the North Yorkshire Dales. Over the years writers, artists and visitors have sought out the North Yorkshire Dales for its unspoilt, breathtaking and dramatic scenery. Today this special place is the number one destination for horse riders, walkers, and cyclists alike, and for those who want to explore the beautiful villages, experience a traditional agricultural show or village gala or just enjoy a gentle stroll or picnic in the fresh air. It’s a place for all seasons with something for everyone. 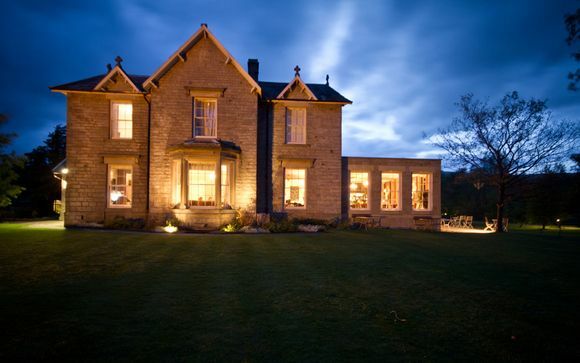 Enjoy a stay in the Yorkshire Dales at the wonderful Yorebridge House. With a range of unique rooms, an amazing restaurant and a fully stocked bar - you're are primed to have the ultimate countryside getaway. This offer is based on a House Room or a Room with Hot Tub. 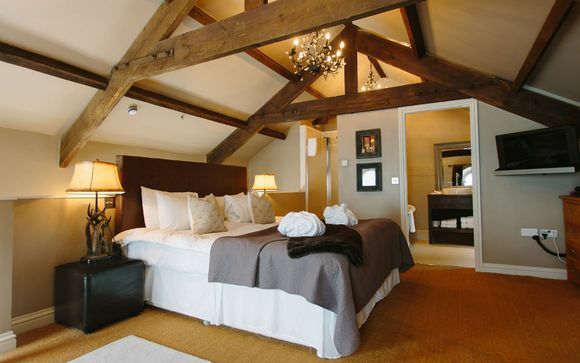 The rooms in the House offer a fantastic level of comfort, with unique decor in each room, allowing each guest to experience a uniquely different stay. Warm atmosphere and calming ambiance ensure a fantastically rewarding stay whatever room one stays in. 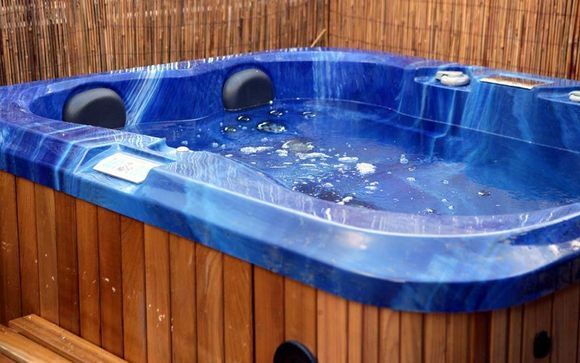 For added luxury, you may also opt to stay in a Room with Hot Tub, where you will enjoy all the benefits of the House Room, with an extra touch of decadence in the shape of a lavish Hot Tub. Rooms to be allocated on arrival. This offer is based on a half board stay which includes 3 course dinner for 2 including Canapés and amuse bouche. Just for you: a bottle of champagne. Restaurant - The dining room is calm and peaceful for breakfast as light streams in through the French windows with views over the North Yorkshire Dales, but by night, is dark and candle-lit, where guests can linger in an atmosphere of decadence. Bar - The sumptuously decorated Lounge Bar is the perfect place to relax and unwind in front of a roaring fire whilst enjoying a drink (or a few!) from the drinks menu. We carry an extensive and eclectic wine list and a hearty range of Whiskies, Cognacs, Armagnac’s, Rums, Bourbons and also the finest selection of vintage ports in the North of England. The Cask Ales are locally brewed and we also offer an exciting and enticing range of cocktails. Exit the A1 at junction ….. for A6108, Scotch Corner. At the roundabout take the 3rd exit following signs for A6108. At the roundabout take the 2nd exit onto Victoria Road (A6108) after 1 mile turn right at Westfields Court, continue for 285 ft then take the 1st left onto Reeth Road (A6108). After 6.8 miles turn left to stay on A6108 and after 0.8 miles turn right to stay on A6108. Continue on this road for a further 0.8 miles when you will need to turn left at Runs Bank (A6108). At the roundabout take the 2nd exit onto High Street (A684) and continue on here A684 towards Hawes, you will then follow on into Bainbridge, as you drive past the village green, take the right turning past the Rose and Crown pub and continue on this road where you will drop down a hill and we are at the bottom. Exit the A1 at for the A684 exit towards Leeming Bar/ Northallerton/ Bedale/ Masham/ Leyburn. Turn left at the A684 signposted for Leyburn. At the bridge street turn left (A684) after 1 mile turn right onto Market Place, at the roundabout take the 1st exit onto High Street (A684) tpwards Hawes. Continue on this road A684, you will then follow on into Bainbridge, as you drive past the village green, take the right turning past the Rose and Crown pub and continue on this road where you will drop down a hill and we are at the bottom. Exit the M6 at junction 37, take the A684 exit to Kendal/Sedbergh. Turn left at A684 following signs for Sedbergh, after 2.6 miles turn right to stay on A684. You will then need to turn right after 2 miles onto Finkle Street (A684) then take the 1st left onto Back Lane (A684) then after 0.3 miles take a right turn to stay on A684 and again turn right after 5.7 miles to stay on A684. After approx 9 miles turn left at Turfy Hill (A684) then take the 1st left onto Penn Lane (A684) and continue to follow A684. After 4 miles at the junction turn left heading towards Askrigg, you will then drop down a hill as you are leaving Bainbridge and we are on the right at the bottom of the hill. Exit the M6 at junction 37, take the A684 exit to Kendal/Sedbergh. Turn right at A684 following signs for Sedbergh, after 2.6 miles turn right to stay on A684. You will then need to turn right after 2 miles onto Finkle Street (A684) then take the 1st left onto Back Lane (A684) then after 0.3 miles take a right turn to stay on A684 and again turn right after 5.7 miles to stay on A684. After approx 9 miles turn left at Turfy Hill (A684) then take the 1st left onto Penn Lane (A684) and continue to follow A684. After 4 miles at the junction turn left heading towards Askrigg, you will then drop down a hill as you are leaving Bainbridge and we are on the right at the bottom of the hill. Head out of Harrogate on Ripon Road (A61), continue to A61 going through 3 roundabouts. At the 4th roundabout take the 2nd exit onto Ripon Bypass (A61) following through 3 roundabouts, at the 4th roundabout take the 1st exit and again the 1st exit at the mini roundabout onto North Road, you will then come to a set of traffic lights where you will need to turn right onto Palace Road (A6108) and continue for 5.4 miles. When you get into West Tanfield you will need to turn left at Main Street continuing to follow A6108. Once you get to Middleham follow the road round to continue on A6108. Just after crossing the single lane bridge turn left onto Low Lane, signposted for Wensley. At the junction turn left to continue on A684 towards hawes then keep following this road until you get into Bainbridge, as you drive past the village green, take the right turning past the Rose and Crown pub and continue on this road where you will drop down a hill and we are at the bottom. There is no set helipad but the field to the east of the hotel is accessible by a gate onto the grounds and has plenty of flat places to land. Please let the hotel know if you plan to arrive/be collected by helicopter.